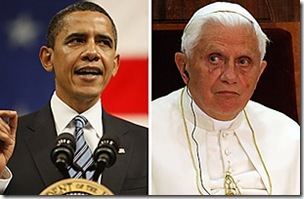 President Obama is scheduled to meet with Pope Benedict XVI today. I don’t know if anything interesting will come of it, but it will probably be an intriguing meeting if you were a fly on the wall. With the conservative vs. liberal views and the disagreements on abortion and stem cell research in particular, there could potentially be some uncomfortable moments, but I trust that Obama will handle it well. It will be interesting to see if Obama gives another shout-out to non-believers, but I doubt that will happen. It’s probably not the appropriate venue for atheist talk. However, there might be some talk about Islam which could spice up the meeting. I don’t have much confidence that the meeting will accomplish anything productive or beneficial other than, perhaps, some small modicum of camaraderie. When you meet with someone who thinks that condoms increase the spread of AIDS, wafers turn into flesh, dead men walk, and omnipotent beings communicate via burning shrubbery, it’s seriously tough to get a rational message to have any effect. Maybe they’ll just talk about helping poor people.